We are Award Winning and Best rated tour Operator in Jaipur (Pink City), Rajasthan, India. A new entrant from Toyota after the success story from the Qualis, Toyota has refined everything that the quails lacked, better leg room, better ride ability. Can take upto 7 passengers (With Luggage on the roof Rack). The interior is the innova is quite roomy, probably roomier than the Tavera Innova in india. The Innova's dash is very smart and modern. May get the axe in India dueto cost-cutting, we think. - By Toyota Japan offers best A/c and comfort in its class. Recommended for small groups or large family. 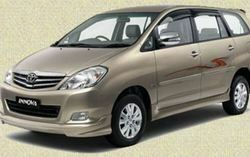 Online linecarrental.org (G S Holiday) provides you 7 Seater Toyota Innova group of 6 persons or less. There have 2 separate seats for driver. Doaba Luxury Travels offers Toyota Innova is a popular multi utility vehicle conducive to entire world conditions. This six seater vehicle offers excellent ride, world class comfort and super performance making your travel pleasant and enjoyable one. It comes with world class safety feature, versatile space and modern styling.